I love to think of him up there, generous, strong, fighting, like he always did, for a better world. The news of the loss of Muhammad Ali leaves me and my family shocked and deeply grieved. With his death, we lose a real hero, a universal icon of courage and civil engagement, one of the crucial figures of our days. Together with Veronica, my children and the entire staff of the Andrea Bocelli Foundation, with the heart full of sadness and gratitude, we wish to express our sincere condolences and ideally get closer to Lonnie, to his sons and daughters and to the whole family of the great Muhammad. His memory will live, not only in school books and in the heart of those who loved him, but also in the eyes of the world, for he contributed to make the world a better place, where to live in peace and fraternity. Some years ago, life gave me the privilege to meet him and, after, to be able to call me his friend, and follow him on the ring since ever, with passion and admiration. To meet him has been a dream come true. I remember that, together with a mutual friend, Jimmy Walker, I went to his house, unexpected guest, on the occasion of his wife Lonnie’s birthday. When I had in front of me that irreducible athlete, that man exhausted, but not bowed by the disease, Ali broke a silence that – I was told later – had lasted for days, in front of the astonished faces of the participants, asking me a prayer (“sing for me”, he said) that with joy I could honor, dedicating him an Italian melody a cappella, with my voice breaking with emotion. On that occasion, Muhammad gave me two of his own boxing gloves, autographed, that I keep like a relic. The next day, in front of the Phoenix arena packed with spectators, in the front row there was Muhammad, I came out wearing those boxing gloves and I paid homage to him, while the final notes of the “Nessun dorma” were resounding. Nothing more appropriate, I thought, than to greet the great warrior with that aria closed by the verb “vincerò” repeated three times and able to tell, at all latitudes, of a state of mind characterized by burning passion and by inexhaustible will power, just like the personality of the invincible champion that was in front of me. Ali is a myth, not only for his own one, but for at least three generations, he is a man who has been able to make people feel his strong opposition to war and violence. Universal icon of courage and civil engagement, he never stopped to be on the ring, until the end, facing his battle against Parkinson’s Disease. Thanks to Muhammad, at the Barrow Neurological Institute in Phoenix, there is a center of excellence, among the most advanced, dedicated to the treatment of the Parkinson’s disease. Thanks to the support of Celebrity Fight Night and of its inventor, Jimmy Walker, the “Muhammad Ali Parkinson Center – Movement Disorder Clinic” offers practical help to those who are suffering and cannot afford medicines and cures, and to their families. The entire world mourns his death, and prays for Muhammad, for his enlightened soul, whishing that he can continue his path in peace, free from a tired body, and that he can be everywhere, and everywhere he can continue to inspire us. I am writing from the plane that is bringing me back home, where I will hug my sons Amos and Matteo, where my relatives and close friends are waiting for me, but also my beloved horses and the flavors and aromas of the Marian month, a time in Italy when nature is rejoicing, in which life triumphs in all its beauty and softens and instills hope even in the most tired hearts. Behind me Seoul that “Land of the morning calm” where I gave the last concert of a tour that started, almost two weeks ago, in Mumbai, on the occasion of my Indian debut. Adrenaline is still rushing, to the point that I cannot sleep. My mind is crowded with many events, public and private, many meetings that will turn into sweet memories. I am pleased to share them here, starting from a very vivid image, not from the stage, but as a spectator, in the audience, next to Zubin Mehta and his wife Nancy, while on the limelight were performing the very young choristers, and instrumentalists of the “Mehli Mehta Music Foundation”. Our encounter with India could not be more cheerful, thanks to the enthusiasm and skills of a multiethnic army of young musicians educated to beauty, that Veronica and I were able to applaud as soon as we landed in Mumbai. This is one of the many philanthropic realities, resulting from the generosity of one of the greatest orchestra conductors, precisely Zubin Mehta. In the past days, for his eightieth birthday, I had the privilege to celebrate him, singing in concert, just in Mumbai, his hometown. And it was nice to see his surprise (and soon after, his emotion) when all of a sudden the orchestra, not giving ear to his baton, started to sing, instead, the classic “Happy Birthday”. After the charming Indian experience, festive, fascinating and also a bit surreal (because of the enormous “Brabourne Stadium” – the Indian Temple of Cricket – that hosted the concert), we flew to Abu Dhabi, where we received the embrace of those extraordinary people and found a summer temperature. Taking advantage of some free hours, some friends have given us the thrill of living a sunset in the desert… And so we have felt the vertigo of a boundless and timeless place, that has always been, for Jesus Christ as for many other mystics, conceived as a space for meditation, where to rediscover oneself. Running through the dunes with our little Virginia, has brought us back to when, many years before, Veronica and I had visited the desert with Amos and Matteo, at that time young kids…and joy has mixed with nostalgia, to the point that we have decided to return soon there, all of us together, among those sandy hills. Before the following stop, the tour has provided a twenty four hours break that, (let me tell you a little secret), we have used to visit Oman , a nation of incredible natural beauty. In Muscate, I have taken my first swim of the season in a clear blue sea, but I have also had the opportunity to make new friends. After twelve years I have been able to meet once again the Filipino community and I was astonished by their kindness, I have been able to dive into the heart of a megalopolis like Manila , chaotic yet hospitable, appreciate people who still live their Christian faith with enthusiasm and pride (something that in Europe is not so frequent to happen). One more great Capital of the East, another amazing welcome: Tokyo has remained in my heart, creating the firm intention to get back there soon, and the regret for a very short stay because of the tight commitments of an agenda that, in the end, has taken me to Seoul…Where – a couple of hours ago – I have closed with a flourish, feeling euphoric at the idea of sharing emotions with an audience so involved, but also because, I confess, of the joy to perceive “the smell of home”, just like my beloved horses that, when they smell their stables from afar, they gallop with even more enthusiasm! In Korea , our friend Sumi Jo wished us the best of luck…she, who was engaged in Italy , right as I was engaged in her country. Sumi the famous soprano that I will soon meet, sharing the stage, for an event that I cannot yet mention, but that will soon be announced. Speaking of great artists, I would like to thank my travel companions, the conductors that were at the helm of the orchestra, Zubin Mehta, Carlo Bernini and Eugene Kohn, soprano Maria Katzarava, with whom I have shared all stages, the pop guests Balqees Fathi, Christine Allado, Sara h Àlainn and Ilaria Della Bidia. Finally a special thank you to the flutist and close friend Andrea Griminelli: despite my being, on such an occasion, a very poor student and a modest performer, the flute is an instrument I love and I am never tired of playing, listening to, and accompanying at the piano. Not only art, but also the cheerfulness of Andrea and his passion for life, have remarkably made easier the moments of tiredness which may arrive during any tour. And here I am, once again in the clouds, galloping home, with my heart full of gratitude towards life and towards He who created it, feeling indebted with many people that I have met, and that have given me their time and their affectionate listening. Just like you, who have been so kind as to listen to me, sharing my comments, waiting to meet again in person, for a handshake, in a theater, or on the notes of a song. Dear friends, right tonight, on Valentine’s Day, my short American tour has ended. As I had already said on this very special page, I have shared with my audience the song ‘Autumn’, which I have studied for this very special occasion, as, in my opinion, it is a wonderful love poem sung on an equally wonderful melody. To you instead, I will trust the verses that on Valentine’s Day, I wrote and sent to Veronica. Thanks for your patient attention. what human speech will not find the words to say. while you spend your life, dedicating it to me, in every way! and still you love me so far, and this you don’t regret! And of your love tired I will never get!!! my best wishes for Valentine ’s Day. Winter does not forgive, not even when it seems mild, like this year; that’s why this morning I woke up totally voiceless. Today it is a windy and quite cold day. Fortunately, as usual, there is music to lift our souls. Housebound, I have started surfing the net and I have fished out a very beautiful piece, bearing the signature of Bovio and De Curtis. Its title is ‘Autumn’ and it has been performed by many exceptional interpreters of the past century: Mario Del Monaco, Giuseppe Di Stefano and Beniamino Gigli, just to name some. Listening to these great performances, for some minutes, has made me forget everything. I have immediately downloaded the score and I have started learning it by heart. I have in mind to record it the soonest possible, but also, to perform it live, may be just on Valentine’s Day for all those who love, or love one another, if I can find a good orchestration, or if I can have one arranged in time. ‘Autumn’ is an extraordinary love song, where is sung a heartbreaking feeling because of distance. … A pain that, alas, I know very well… It will be a great pleasure for me to share with many of you the beauty of this composition and the emotions it can convey. Together with Veronica, my kids and all my family we would like to wish you a peaceful, intimate, wonderful Christmas, through a song, a small gift, (words blossomed thanks to music) wishing you all the best. We have thought of “La vita è bella”, because it is a beautiful melody and offers a simple but crucial statement. Because, it is worth remembering, every day, with the rising of the sun, that life is a marvelous gift. Besides - you will allow me this paternal tenderness - during a recent TV special dedicated to my new CD, “Cinema”, my little Virginia, three and a half years old, has, for the first time in her life, performed on stage, joining the chorus and singing this joyful, auspicious song. I am about to leave once again, this time for Asia; many hours of flight, two concerts and then I will fly back to Italy, just in time to rush to Milan for the great opening concert of the Expo. It is a very intense period of work: a few days ago I finished the recording of Aida which took place in Florence from the 11th to the 15th included, under the direction of Maestro Mehta. Then I returned home to complete the recording of an album that I find really extraordinary, first of all because of the choice of songs, and secondly for the beauty of the arrangements, and last, but certainly not least, for the technical quality of the recordings, increasingly accurate and technologically advanced. Let me say, therefore, that music continues to fill my days, and I cannot but thank Heaven for this. Dear diary and dear you all who will have the goodness to read these few lines, I feel I should be scolded for my guilty discontinuity, but I promise to get back to writing very soon, may be immediately after the event of the 30th, that for my peace of mind will be broadcast worldwide, to tell you some of the things that cannot be perceived on television. Before leaving you my dear diary, I would like to tell you that in the past days I have had to deal with a nagging sore throat, and that almost all the rest of my family has been affected by this problem. Phew! The dry air of the airplane certainly will not help me, but there is little to do: in a few hours we will leave and on our arrival we will see. I am leaving you with the promise to return very soon, to tell you something more about the songs of the album that I have just finished. I am sure that it will be a real surprise, also for those who know my voice well, because this time I dared and I have done it willingly, to give my contribution to masterpieces that until some time ago I would have not thought I could deal with. I am back to you after a very long time, for Easter greetings, but I am doing it with a special feeling in my heart, that is due to the extremely strong human experience I have just gone through in Haiti, right in these days. What I have seen and lived in that place cannot be told and I will not do it. There are abandoned children, who have got nothing to eat, to drink, not a rag to wear; no one to give them a cuddle, a caress, to give them hope. There are men and women who walk under the sun, who have nowhere to go, whose only aim is to reach night and say that they have survived hunger, thirst, diseases of all kinds, mainly due to the total lack of hygiene and nutrition. In Haiti I have seen all the good and evil that man can do: evil caused by corruption, lawlessness, by the most unspeakable wickedness of some; by the selfishness and indifference of all those who could do something and do nothing; and the good that blooms within the hands of those few who, tirelessly, give their lives to the others and do it, twenty four hours a day, with a joy and an energy, which, evidently, have their roots elsewhere. Among these few stands the gigantic and charismatic figure of Father Rick, who with a group of young people that he himself, grew up in the Kenscoff orphanage around 30 years ago, has done and goes on doing miracles every day. He brings hope, concrete help, medical care, brotherhood and much more there, where everybody else would, hardly, survive for more than one day. It is with this group of incredible people that my Foundation team works every day like a big family that across the ocean works hard to give the Haitian people the possibility to live a dignified life with an eye to the future. If good means building and improving, evil means destruction, therefore it is not a fair battle, but it would not be right to surrender for the dignity of every individual who, like me, living in prosperity, aspires to feel at peace with their conscience in their world, within their own family, in a country that, far from being free from serious problems, is, however, in a condition to give everyone a minimum dignity and hope. Father Rick smiles and asks us to believe in his brave battle and I feel I have to share his optimism. Facing such a significant example of life, in front of a hero of our times, I can only bow and promise help. Father Rick assures us that there is a real hope and I believe him, because he is a man who can see beyond, who unmistakably sees with the eyes of those who fight every day at the forefront, he smiles and he is happy. Easter teaches us that good always wins over evil, even when everything seems lost. Therefore, let me wish you all, a happy Easter full of joy and hope. I will spend it in a very unusual way: ten thousand meters high over the Atlantic Ocean to get back home. In Italy I will have to tackle the recording of Aida with Maestro Mehta, and then I will leave once again, on a tour to Asia. I know that many of you feel close to me, and this gives me strength. Happy Easter to you all, that I hope to meet, personally, along my way, maybe for a simple handshake, which for me is, anyway always, something full of meaning. I am back asking for shelter, while I am again above the clouds lulled by the constant noise of the airplane: a buzz that punctually accompanies this travelling of mine around the world, this strange sort of accelerated pace, written in my destiny and to which I am, apparently, accustomed (but that, when I think of it still makes me feel dizzy). Dear diary, I know that on the other side of my voice, there is always a friendly and patient person who is there to accept – through this white sheet – these fleeting thoughts, my secrets. It is, therefore, to a friend, that I am talking, in silence, while, in a few hours I will be once again in Miami , in Florida , where I will give three concerts, one after the other, all dedicated to Valentine’s Day. Even the noblest celebrations, and even the most sacred ones, can slip into the commodification of feelings, into the logic of the market that tends to blur the true core values. Nevertheless, I believe firmly in the ethical usefulness of this beautiful custom. In our inner calendar Valentine’s Day is the birthday of love. Valentine’s Day is a ritual, a thought that is embodied in gesture: it is up to anyone of us to give meaning to that gesture, and really celebrate love, the engine of the world, paying homage to the mysterious and wonderful gift of life (because, as someone said, you only live as long as you love). While this celebration is getting closer, optimism finds new oxygen, because love is our inner nature, because there is no wasted love, and, indeed, it is a sweet and vital commitment, to cultivate this source that is within us, and that makes fluffy, under our feet, even the driest soil. Love spreads, just like a sound vibration, and it is contagious: and this is what I think when, with little strength and, and holding off my weaknesses, I get on stage with the secret hope to do my part…With the desire – as anyone can do, in their field – to be at the service of love. Because we ourselves are the mirror of that divine and supernal love that created us. Love is a plural noun, besides being in love with your partner, you can be in love with your dear ones, with your friends, with all the people living in this world. Not by chance, 2015 has been consecrated by the Holy Father as the Year of the family. Well even within the family love can exercise its extraordinary power. Paying homage to this indication of Pope Francesco, dear diary, I would like to propose a reflection on a very particular kind of community, the one made up of the many children that fate has left without parents and who have found their own family, within an orphanage. Theirs is not an easy life, neither from the material, nor from the affective point of view. But, in the misfortune to remain apparently alone, I think with joy of those children who have had the fortune to meet along their journey many priests and nuns, as well as many lay people, who have taken care of them, thus constituting a new enlarged family. On Valentine’s Day my thoughts go to the many nameless angels who have given these children a house and their love…My gratitude goes also to an angel, whose name I know, because I have had the great honor to know him and spend time with him: Father Rick Frechette, who has given in Haiti the warmth, the affection, the care and the guide of a father who has given back a family to hundreds of children. I am back to you once again; I am here to ask for shelter. To you, to my discreet confidant who knows how to listen and how to be a messenger, I want to reveal my state of mind and fix some thoughts, right now that Christmas Day, the most beautiful day of the year, is so close. It is one of the precious lessons my parents have given me and that I already used to put into practice when I was still wearing short trousers. Every night, along with my prayers, in the silence of my bedroom it was time for a balance of the day just gone. I used to think of what I had learned, of my goals and of what I had stumbled upon, something that often happened. It was a way to give weight to my experiences, keeping them inside; it was the desire to make the best of my mistakes, but also to have a grateful thought for those who had expressed friendship or goodwill towards me, and to plan a better tomorrow, a happier and more constructive one. One after the other, the days have become months and then years. And yet, still today, this is a habit that is dear to me, that time has made pleasant and necessary, even more when, like in this case, there is a full calendar that is going to be filed. I am no longer in the little bed of my birthplace, surrounded by the night voices of the Tuscan countryside (sounds that I loved, because they spoke of a mysterious life, that was swarming around us, watching over our sleep). Today most of the times in a hotel bedroom, where I have to think in which part of the world I am, I still make a balance, I make plans, I try to evaluate my mistakes, to thank God. To thank him for all that – most of the times undeservedly – life has given to me, for the marvelous family that surrounds me and for you all that follow me with affection and who appreciate the art that I obstinately try to celebrate, with my poor means. The one that is leaving us is a year full of great events and great changes. It makes me feel dizzy when I think that Amos, my eldest son, is studying to become an aerospace engineer. As well as I am feeling dizzy when I think of little Virginia who has just started her course of studies, experiencing her first day of nursery school…while Matteo, high school, is going through that wonderful and complex tumult that is a blossoming life, belonging to a future that still has to be monitored, in order to understand which will be “his own path”. It is a great joy, dear diary, when you realize that the reflections and the advice offered to your children, are never vain…when you talk to your children with love thinking of their own good your words never are a “waste of time”. Even if they are strict words, although at the moment unpopular, and apparently disregarded, there is always a time when a father reaps what he has sown…And, this, is a very sweet sensation that is renewed, even more, on such days when the balm of family intimacy repays every effort and parental sacrifice. But my debt of gratitude, my affection, goes not only to, my family and to the circle of friends and collaborators with whom I share every day: every person who has decided to invest their time listening to me, through my albums, or attending a concert of mine, is a dear friend to whom I am addressing my grateful thoughts. I read every letter I receive (because they all reach me, and I sometimes personally reply) and this is for me a great stimulus and a spiritual enrichment. Every good word is as worthy as the most famous recognition, every encouragement spurs me to improve, to give the whole of myself, when on stage and whenever I have the possibility, I always try to convey positive values, a bit of optimism and, where it is possible of happiness. The year we are saying farewell to, has taken me, once more, to many countries and to many stages and each of them has given me something new. The year 2014 has also been the starting year for the Italian Celebrity Fight Night, a philanthropic event that has had a resounding success and that will take place also this year, in the month of September, in Florence but also in Rome . The latter is a place, which is in my heart and in the heart of many, because it is the center of gravity of Christianity. The year 2014 has been a year of great growth and of great challenges also for the Foundation bearing my name…Last week in New York we had very important meetings which we will try to capitalize in the best way possible, because many people trust me and this structure. A trust that, I for one, try to deserve every day. A few days ago, during a speech at the United Nations, Veronica and I reminded (first of all to ourselves) how Christmas is not only on December 25th, but every day of the year, and how its spirit should guide all of us not to forget our less fortunate brothers...we were thinking of the extraordinary work that in Haiti a special person is carrying on – together with his team, of which ABF is part –: Father Rick Frechette, the priest and doctor who has created the only free pediatric hospital in the island, the Saint Damien, a hospital that today has the dramatic need to be supported because - after the earthquake – it had to quadruple the services giving aid not to 20.00 thousand children a year, as before, but to 80.000. It is with this intention, it is with the desire to spread this “Christmas spirit” that we perceive in these days, that we are approaching the coming year. I will welcome 2015 in the United States , but always in constant contact with my beloved Italy , my home country that I always carry in my heart and that holds so many affections, and dear ones. And in Italy I will be back and- once more I will have the honor to represent it –at the EXPO opening ceremony, when all the spotlights in the world will be focused on Milan and on the whole of Italy. Thanking God, dear diary, the latest technologies allow us increasingly to evade distances. To the point that nonna Edi, from Lajatico, can see her young granddaughter while she is playing in the swimming pool with her little American friends on the other side of the globe. Also through this sheet that is listening to me, I have the sweet possibility to extend my sweetest thanks to many people near and far. To all those who have contributed to that living laboratory which is the Foundation (from the president to the neophyte volunteer), to all those who, if not personally, through my voice, I have had the joy of having virtually on my side, I am sending my best wishes for a wonderful Christmas! How I’ve neglected you! Partly because, as you surely know, I’d never want to fill your pages with daily trivia, and therefore I try to reserve my entries for those very special moments I feel are worthy of note. This time, however, I’m here for the purpose of a little confession: You know how the purchase of a newly released CD can generate a feeling of excitement and hope? Due to my proverbial laziness, I hadn’t yet gone to purchase either of my last two recordings, even though they’ve been released more than a month ago! So finally, despite my embarrassment (as you can imagine) I decided to just go to the music store in Viareggio and buy them. Getting back into the car I immediately inserted the disc into the player, and began listening (with considerable trepidation, by the way) to the new recording of Manon Lescaut. Rarely in the past have I been truly moved by a recording in which I myself have participated, but this time I must confess I was stopped in my tracks. Please don’t rush to judge me harshly as an egomaniac! I’m not talking about my voice here, nor about my interpretation of the role. I’m referring to the final result that was achieved, marrying the beauty and power of the work with the extraordinary technical level of the recording. The recently developed machinery to optimize digital sound quality has really made a difference. I think I can safely say that the representation of my own voice as well is closer than ever to its true sound. But don’t worry, Diary, I wasn’t weeping in the car or having physical symptoms. I’m not aging that rapidly! But I was struck by the reaction of the dear friend sitting next to me driving. He’s not a music professional and enjoys a completely different life. But after a few minutes of listening, he began to exclaim his wonderment and approval in most colorful metaphors. «But how did you make this recording?», he finally asked. «Just like all the others», I answered, adding «and by taking full advantage of the latest available technology». Apart from anything else, it was thrilling to have purchased the CD of Manon Lescaut, with my voice in the role of Des Grieux, just a few kilometers from where Maestro Puccini lived, and where he composed most of his masterworks. Oh, how much I owe to life! To this life of mine so overfilled with commitments, travel, hard work, and never-ending study. Yet I forget all those sacrifices in a flash when I receive such a gift. 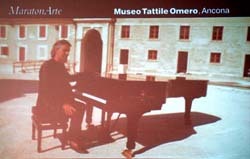 And above all, it’s the affection of my public that brings the greatest joy, received upon the infinite stages of every corner of the globe, or from the public I’ve met in my home town of Lajatico (where they arrive from all around the world as well) for the annual Teatro del Silenzio concerts over the last ten years. Allow me to take this moment to offer heartfelt thanks to Maestro Domingo for his masterful conducting, and to Ana Maria, who on this occasion confirmed herself as an extraordinary singer and a dear friend. And to all the other colleagues who were around me, each giving the best of himself. A special thanks goes to Eugene Kohn, and to Carlo Bernini, who patiently helped me to make this wonderful score my own. To Virginio Fedeli, who succeeded – dare I say miraculously – to pull it all together for the best. I must also give thanks to Veronica, who supported me from the first days of study, and to my three children, who had to listen to my efforts of several months; first at learning, then at polishing the role. Roles such as the one a tenor has to confront in Manon Lescaut contain moments that can seem like unreachable peaks. But then, as if by magic, everything begins to feel familiar, every note becomes a friend. And this time as well, we have managed it as a team. I hope this latest effort of mine will be well received and may bring some positive emotions, as I personally experienced many years ago, when the first recording of Manon Lescaut entered my house, causing me to shed so many tears. I realize that I have neglected you very much, but if you only knew how many things I have had to do, and how many I should have told you. There would have not been the time. Suffice it to say that tonight has ended the week of events, organized thanks to more than one year of work, by Celebrity Fight Night Foundation with the support and help of the Foundation that bears my name. What has been done is now more or less in the public domain, but newspapers and TV do not know how many efforts, how many anxieties, how many doubts, how many never ending discussions, sleepless nights, how many holidays have been necessary to cultivate the hope of transforming the tears of many hopeless children, in smiles filled with renewed zest of life!!! In our wonderful country everything is difficult. In short I would say that it is difficult to do things, because to take a step, you have to overcome a thousand obstacles of legal and bureaucratic nature. You feel as if you were driving with the hand-brake on. But this is not the time to complain, it is rather the one of sharing with many people of good will, the joy of having accomplished a task that since the beginning has seemed to be something exceeding our poor efforts. Soon many unfortunate children, left to their sad fate, will have a school and above all a full tummy, a ball to play with, books to start dreaming of a future similar to the one of our children. They will be able to read and write and, therefore, will be able to defend their right to a peaceful life. Someone will say that it is a drop, a single drop of pure water in the ocean, but if everybody does something, drop after drop, it will be possible to purify this ocean and it will be beautiful, wonderful indeed, for everyone, as Mother Teresa used to say, be able to mirror ourselves in that deep blue sea!!! I am a bit tired, my dear diary, and in a few hours I am leaving for New Zealand, just an ordinary trip…, but the power of a good action is such that, may be, I will not even feel the fatigue of this upcoming adventure. I want also to entrust to your pages a few words concerning Veronica, the heroic companion of my life. I would have never thought her able to fight so hard a battle to win. Her perseverance, her willpower have really surprised me. Those little haggard faces, those eyes marked by pain, by the sight of so many tragedies, their little bodies weakened by hunger and thirst of love must have deeply impressed her, when with my son Amos she went to Haiti; only this way you can explain so much zeal and so much sacrifice in a young mother. I know that Goodness produces other Goodness, and I know therefore that the hours she has subtracted to her little Virginia, to me, and to the rest of the family will bring her joy and great satisfaction. Well done Veronica! Well done you all! You who have walked together, starting from the President of ABF Laura Biancalani, and going on with Alberto, my brother, who has always cared about the thousand problems I leave him to solve, and then all those who have been working since day one and who are too many to be mentioned one by one. I want to thank also my two sons Amos and Matteo, who have supported, encouraged, and often accepted the void caused by too many engagements. …If I told that in a short while I am going to rest in Australia, I think nobody would ever believe me, perfectly knowing that I will have to face days of flight and concerts across the world, and instead I think of it as a time of rest. Now I have to try to sleep a couple of hours, but I will be back to you, dear diary, as soon as I can. This year, in Italy, in addition to the warmth of the last summer weeks and to the approaching of the grape harvest, the month of September will have in store a great event that will warm many hearts, a complex and ambitious project related to solidarity which we are excitedly and happily looking forward to. I would like to share with you this new challenge, an exciting challenge the will take place in my beloved Tuscany and that we are ready to welcome…An event starring one of the most important nonprofit overseas Institutions the Celebrity Fight Night Foundation that has been active in fund raising for the past twenty years, particularly in favor of the Muhammad Ali Parkinson Center that it has helped in creating and growing: CFN that from the 3rd to 8th of September will, for the first time, move from USA to Tuscany proposing a benefit trip full of music, art and beauty events. 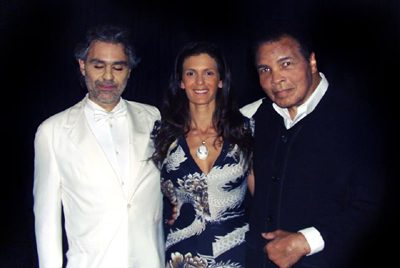 My wife and I, along with the staff of the Andrea Bocelli Foundation, will host it. Many friends, my personal ones and the ones of CFN have responded to the invitation from Sofia Loren to George Clooney, from Zubin Mehta to Lionel Richie, from Reba McEntire to David Foster and Michelle Hunziker. So this is a charity initiative that promises to be unprecedented, starting from the guest parterre to the proceeds whichwill support ABF and the Muhammad Ali Foundation. It is a wonderful opportunity to help many people in a concrete way: in our case the Celebrity Fight Night represents a key step to achieving some ABF projects of Empowering People and Community, especially in Haiti, a land we particularly love, Haiti, for the education and care of the children who live in that wonderful and unfortunate island. Haiti where three schools funded by ABF are growing, day after day; after the schools we are going to tackle a new challenge: bring water, electricity development to the families and to the Communities of our children. For further information on the event please see CFN site (www.celebrityfightnight.org/Content/Italy2014/Default.aspx), while for the ABF projects which will be achieved thanks to this event, you can follow us on our site www.andreabocellifoundation.org. If we have the joy to host here in Italy Celebrity Fight Night, we owe it to a chance meeting (with Jimmy Walker the Founder of CFN) which has triggered a double, great friendship, whose birth I would like to share with you. It happened some years ago: an elevator is ready to go up. Jimmy is there, in my memory, behind the sliding doors of the cabin while they are going to close. I go up and down, in the hotel that overlooks Central Park, as if it were my second home: on the top floor there is my refuge in New York – a muffled place where to rest and study – It seems to be on the peak of a forest but, on the contrary, it is in the heart or better, in the navel of the world. The elevator is going to go up, behind it there is Jimmy and his hand that chooses to slip between the doors to stop their closing in extremis. He enters between me and my companion Veronica, a sudden and unexpected mate during our rise. Taking advantage of the forced intimacy and without wasting time (despite our expectations at that point very pessimistic) he does not turn out to be a robber; he does not want our wallets, but he is asking for a confirmation of his suppositions “Are you Bocelli”? After expressing his strong admiration for the results of my profession, he told us to be a friend and a cooperator of Muhammad Ali. A few minutes later, after breaking the ice, we got aware of the happy circumstance that would take me, in the following days, just to Phoenix for a concert. This way was born the friendship with Jimmy that gave me the possibility to meet his friend, my myth Muhammad Ali. Two days later, on the occasion of the birthday of Lonnie Ali, thanks to Jimmy, we were able, unexpected guests, to wish her a happy birthday with music, in front of the astonished faces of her husband and family. Thanks to Jimmy, even my idol broke the silence asking as a prayer («Sing for me») something I could honor with a great joy, dedicating him an Italian melody a cappella, while my voice was choking with emotion. Even Jimmy is a champion: his Celebrity Fight Night Foundation has been fighting and winning indifference, looking for increasingly ambitious goals, to offer practical help to those who are suffering, and to those who are less fortunate. With Jimmy, also ABF has recently established a fruitful cooperation, in a virtuous circle of philanthropy that, at its origin still has two sliding doors that, luckily, did not close. For some years with great pleasure, I have contributed to the CFN events. And this time, in the name of the friendship and esteem that binds me to Jimmy, and with Muhammad Ali’s blessing, the event has been brought to our Country. The Italian Celebrity Fight Night will see the participation of over a hundred American tycoons, billionaires, who will reach Tuscany – by means of a private flight –The stay in Tuscany will provide a series of initiatives to show them the best of art, culture and entertainment, thanks to friends like the Cavalli and Ferragamo families who will open the doors of their homes, or the maisons Ricci Pucci and Scervino. Florence will host the Gala that will close the event on Sunday 7th September 2014. We will be guests of the Comune of Florence, in the wonderful Salone dei Cinquecento of Palazzo Vecchio. A prestigious Location, and a veritable treasure trove of paintings and sculptures, which well expresses the uniqueness of this event. During the Gala at Palazzo Vecchio, I will have the honor to perform under the baton of Maestro Mehta who will conduct the Orchestra of the Maggio Musicale Fiorentino. While on September 5th, in the course of an evening organized in our home in Forte dei Marmi, we will have the honor to celebrate in advance Sofia Loren’s birthday, a few days before the whole world does. We are getting close to the first week of September and to the CFN Event, and as I said before, with great excitement and a certain trepidation. But we have on our side, to mitigate the anxiety for such a complex project, the certainty of having dealt with it the most seriously possible, with as much effort as possible. By the way, let me share with you how proud I am, of all the tireless work that my wife Veronica, along with the President of the ABF Laura Biancalani and her team have done in recent months. I have just met an extraordinary person: Gillo Dorfles, an internationally respected intellectual of the last century whose highly interesting book, entitled “Dal significato alle scelte”, I read years ago. Gillo is now 104 years old, and he carries those years splendidly. In spite of the passage of time he is still driving his own car, playing the piano, and -above all- viewing life with an almost childlike enthusiasm that inspires in me a good natured envy. His amazing vitality represents a slap at my comparative indolence and laziness. Professor Gillo greeted us with warmth, listened to us with interest, and spoke with total clarity. When I sat at his piano and began the aria from ‘Manon Lescaut’ (“Donna non vidi mai”), he stood next to the piano absorbed and moved. At the end he even thanked me with such enthusiasm that I felt embarrassed. And to think he lived in the home of Arturo Toscanini- who knows how many celebrated and exalted singers he must have had the opportunity to hear live! How strange is life: This man has been vacationing at Lajatico, my home town, for more than fifty years- ever since his father bought a house there- and yet I had never met him!!! But where was my head during those years in Lajatico… and where has it been until today? I could have had countless opportunities to meet him, hear him speak, and learn so much about a century already past- a century that left us multiple problems, understanding the origins which could provide more hope for a solution. How strange life is! The previous owner of Professor Gillo’s current home was Faliero Bocelli, a distant relative of my grandfather! Time and intelligence exert an irresistible attraction on each of us. Professor Gillo, with his extraordinary intelligence, seems to have discovered the secret of making time stand still. From the height of his 104 years, upright and solid as an oak, and ever dedicated to understanding the world, he represents for me an example of how to live, with verve, every moment of this marvelous adventure called Life. 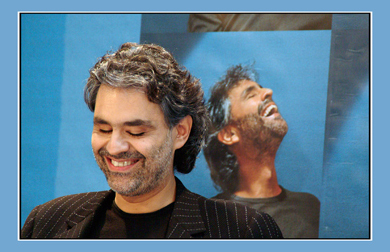 In a few days the new version of my site www.andreabocelli.com will be uploaded. I hope it will meet with your approval and will be the tool that will reinforce the feeling of gratitude and friendship that binds me to you. To this end I have had something new introduced, it is a novelty: a surprise that I hope you will like, a space where I will have the possibility to write directly, without filters, or intermediaries. A very concrete way to feel closer to those who have followed me for years and have given me strength, as you have done and are doing from the time of my very beginning. It will be a way to thank you and show you my deepest gratitude. Through this you will closely know, the thoughts, sensations, ideas and feelings and all the things that, never before, I have had the possibility to let you know. It will be like shaking hands with each of you, and welcome you in my home, where I will do everything possible to make our musical encounters the most intense moments of which I am able. Thank you for your love, you respect and gratitude, that day after day, concert after concert, I get to know and appreciate through your posts. A big hug and see you soon. Dear friends near and far, It is a long time since I have written to you on my website and I am very sorry for this. I wish I had a closer relationship with you, who are my strength and the first reason for my singing adventures all around the world. As you all use a Pc, it will be sufficient for you to have a look on the Internet to see that the spare time I have is very little. When I have a few days of freedom I am so tired that I lock myself at home and try to recharge my batteries with a book or with some of my friends who come over to keep me company. This does not happen very frequently, because if I am not somewhere around there is always something to study or to improve. Torno a voi dopo un lungo, colpevole silenzio, causato da ritmi davvero impressionanti di lavoro a cui si deve il fatto grave di aver lasciato passare il Natale, senza inviarvi almeno un messaggio di auguri. Coloro tra voi che per curiosità abbiano seguito i miei spostamenti su internet, certo sapranno che ho fatto, in poco più di un mese, quindici concerti, televisioni e quant'altro, volando dal Regno Unito agli Stati Uniti, dal Brasile in Germania e poi in Polonia, fino al concerto di Genova. Per la vigilia di Natale ero finalmente a casa, stanco, ma molto felice, soprattutto dell'affetto, che nei miei confronti ho percepito ovunque e che custodisco gelosamente come un dono, il più prezioso che un uomo possa ricevere senza meriti particolari, se non quello di dare sempre il meglio di sé. Vi ringrazio infinitamente della stima, del calore dei vostri applausi, dei sacrifici che fate per incontrarmi ed ascoltare il mio canto, vi ringrazio dei messaggi che mi inviate con ogni mezzo a vostra disposizione, della fiducia che riponete in ogni mia avventura artistica. Da sempre la musica mi rapisce alla realtà che mi circonda e mi rivela mondi ideali, da cui faccio ritorno con un desiderio irresistibile di comunicare questa meravigliosa esperienza all'umanità intera e so di potermi valere del canto, quale unico strumento adatto a realizzare l'impresa. Allora mi ci butto, con tutte le mie forze, con tutta la mia passione, mentre voi fate tutto il resto. Fra qualche giorno, come certo già sapete, uscirà il mio nuovo disco: una raccolta di capolavori, che per decenni hanno scaldato il cuore di intere generazioni. Per me essi rappresentano un tuffo nella mia prima giovinezza, quando, coi capelli lunghi e un'infinità di sogni nel cassetto, iniziavo a familiarizzare con la musica pop e tra quelle meravigliose pagine di musica, che scoprivo poco a poco, dimenticavo, come per incanto, tutti i miei piccoli problemi adolescenziali. Bei tempi erano quelli, a dispetto di ciò che a me pareva! Io cantavo la sera nei locali e attorno a me, tanti ragazzi della mia età si innamoravano, si sussurravano all'orecchio frasi rubate alle canzoni; i sogni e le speranze avevano di gran lunga la meglio sulle difficoltà e sulle disillusioni del quotidiano vivere. Io cantavo così, alla buona, senza concetti e senza preconcetti; cantavo quel che mi suggerivano il cuore e l'età; ciò nondimeno la gente mi ascoltava volentieri e manifestava una certa simpatìa per quel pianista sconosciuto e strano, conchiuso nel suo mondo che già allora era fatto soprattutto di suoni. Non so con che parole spiegarvi l'intensità dell'emozione provata nel reinterpretare quei brani, così ricchi di bellezza e d'ispirazione da un lato, e dall'altro carichi di ricordi struggenti di un tempo andato, che a me pare ieri. Spero vi giunga un'eco di quei ricordi, un briciolo di quelle emozioni, di quella vita che ha attraversato tutto il mio essere passionale ed appassionato, come un lampo. In questi brani ho versato tutto il mio vissuto, del quale oramai siete parte integrante. Dal centro del mio mondo, la mia casa, dove ora mi trovo, vi giunga tutta la mia gratitudine ed un forte abbraccio. I am back to you after a long guilty silence due to the very large number of engagements of last month that led me to spend Christmas without even sending you a greeting message. Those who have, by chance, followed my movements on the Internet, will surely know that in just over a month I have done fifteen concerts, television, and what else, flying from the UK to the United States, from Brazil to Germany and then to Poland up to the Concert in Genoa. Thank you so much for your respect for the warmth of your applauses, the sacrifices you make to meet me, to listen to my concerts. I am thanking you for all the messages you send me in all the ways you can, and for the way you trust every artistic adventure of mine. I have always been enraptured by music that takes me away from reality surrounding me to disclose to me ideal worlds, from where I come back with the irresistible desire to communicate this wonderful experience to the whole of mankind .As I know I can use singing as the only available instrument to achieve this task, I throw myself into it with all my passion, while you do the rest. In a few days, as I am sure you already know, my new CD will be released, it is a collection of masterpieces which for decades have warmed the hearts of generations. For me it means to jump back into the past, to my early youth, when with long hair and a lot of dreams in my heart I began to become familiar with pop music, and among those pages of wonderful music, which I discovered little by little, I was able to forget all my teenage problems. Those were good times in spite of what it seemed to me. I sang at night in clubs and around me a lot of people of my age fell in love and whispered to each other’s ear words stolen from the songs; Dreams and hopes had, by far, the better of the difficulties and disappointments of everyday life. I sang informally without concepts or pre-conceptions, I sang what my heart and my age suggested me to, nevertheless people were glad to listen to me, showing some sympathy for that strange and unknown pianist secluded in his world, at that time already, made up mostly of sounds. I do not know what words to use to explain the intensity of the emotions I felt in performing those songs, so full of beauty and of inspiration on the one hand, and so full of touching memories on the other, of a time that has gone by and that seems to me like yesterday. I hope the echo of those memories can reach you, a little bit of those emotions, of that life that went through my whole passionate being like a flash. In these songs I have poured all my life of which you are now an integral part. From the center of the world, my home, where I am now, I am sending you all my gratitude and a warm embrace. 21st March, 2012: Versilia smiles, kissed by a beautiful spring sun. This is the day that little Virginia has decided to come into the world and warm the hearts of mummy Veronica and daddy Andrea. Her brothers, Amos and Matteo are also very happy and amazingly astonished at the sight of this miracle of life, that once again occurs and, this time, occurs among them all. Just a few days from her birth, Virginia is already a little Princess, loved and pampered by all. Welcome Virginia: may your life by a wonderful spring, just like the one that you have brought to the hearts of all of those who love you. Outside of time and space creates you? Of the universe of which you are queen? Of my time that is crumbling away. Of "spectral notes" and quickly restored me. In my arms and were afraid of nothing. You knew nothing, but you were blissful! But you smiled in your cradle! You were happy then! What has happened? Perhaps you want your destiny to take flight? As in the world you come to the end of your road? And of life you are still asking the meaning! My poor, foolish, ungrateful son! And all that lives you want to be children of chance." Made serene by that brief admonition. And from then I am no longer the same. it has been long time I haven’t come back to you on the web-site, and this is a wonderful opportunity to enjoy some music, some great music, to say hi and first of all to thank you for all the nice words you write to me every day in your letters. Today I am at home, and here with me there is M°Eugene Kohn… come here Eugene…”. Andrea: “ Most of you know already M°Kohn for his brilliant career by the side of the greatest singers of the world and also because sometimes he has been on stage conducting my concerts. Also here is M°Carlo Bernini, you all should know him because we collaborate from the very beginning of my career, actually even before this would start. Lately me and Carlo have been working hard on Gounod’s FAUST, that I will perform in Palermo on the 20th and the 22nd of March. During these days Eugene Kohn also joined to help me with his enormous musical experience by the side of all those singers… Who knows how many times he already conducted this opera…! His French is better than mine, so he’s also helping me in this, that’s why I’ll ask him to stay a bit longer. In my opinion Faust is a wonderful opera, it contains extraordinary melodies that I even listened for the very first time in this occasion. The opera begins with an aged Doctor Faust, he’s sad, alone, he feels that life has gone and has nothing more to give him, nothing more interesting, so he considers to commit suicide. He thinks to give out his life to poison, when suddenly, at the top of his exasperation, he invokes Satan, who doesn’t hesitate and comes… then you all know the story, Faust sells his soul to devil in exchange for youth , and then… the story goes on. ANDREA: “ the tenor’s fate is in the free interpretation to the audience, and I truly hope you all absolve me, because Margherite is absolved…, in the end she dies and she hears the choir of the angels singing: salved…salved…salved. So I wish you will salve me, and I will see you in Palermo if I will not have the chance to come back to you on the web-site any earlier. Thank you so much, goodbye. I take the opportunity of this special an unusual day to present you all the people who collaborates with me daily. Let’s start with Veronica, who all of you know by now, then there is Alessia who is our new entry. Then we have Charlie Tomba who collaborates with us since a while now, hi Charlie… he could speak four-five languages but today he choose to speak Italian, then there is Alberto, my brother, and… there is also Saetta, little Saetta. There are two people missing today, they collaborate with me since a longtime and they are very important : Massimiliano Ballanti, whom I salute and thank and Renate Bausch. Thanks you everybody and hope to see you soon. Dear Padre Rick and dear all of the children whom I’ve met in Italy, in my country…first of all thank you for the opportunity you gave me to feel useful, even if just for a small contribution..
One day a young bride, pregnant, was hospitalized for a simple attack of appendicitis. Doctors had to put ice on her stomach, her belly and after finishing these treatments, they suggested that she abort the baby. They told her this was the best solution because they were almost sure that the baby was going to be born handicapped. But the young, courageous bride, decided to give birth to her son. That young lady was my mother and that baby was me! Maybe it might look like I’m partial, of course, it’s my life, but I do really think that that choice had been the best one and I do really hope that this story could represent an encouragement for the many mothers at times, find themselves experiencing difficult moments, moments in their complicated lives, but they choose to save the life of their baby. I wish them well and hope that I can be there for them one day. I wish you the best and hope to be with you very soon. I’m so sorry not to be free enough to decide when, as my work steals my time. In this moment I’m in Mexico, but I do really hope to come and visit you in the near future.